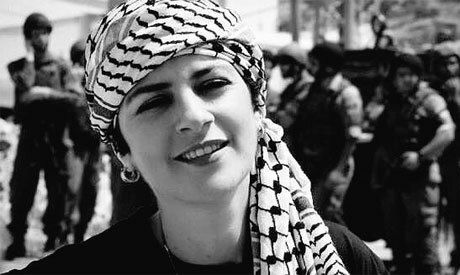 Palestinian singer and songwriter Rim Banna died this morning at the age of 51 after a long fight with breast cancer that lasted nearly nine years. Hailing from Nazareth, Banna's songs are inspired by the Palestinian people’s culture, history and folklore, and their struggles between despair and hope under the Israeli occupation. In addition to writing her own songs, she composed music for traditional Palestinian poetry, and revived children’s songs that had fallen out of popularity. As such, she is known for reviving old Palestinian texts and songs, and blending them with modern singing styles and melodies. Some of these are tahalil, folk songs that usually express a theme of longing and loss. Banna was diagnosed with breast cancer in 2009, and again in 2015, and after several years she lost the ability to sing due to a paralysed vocal cord, yet she continued to compose and create music. Banna studied in Moscow and in 1991 and graduated after six years of study at the Higher Music Conservatory. Her debut album Jafra was released in 1985, and she went on to release over 10 other albums. Some of her best known albums are A Time to Cry in 2010, Mawasem Al-Banafsej (Seasons of Violets, 2007) and Maraya Al-Ruh (Mirrors of the Soul, 2005), which she dedicated to Palestinian and Arab prisoners in Israeli prisons. She performed in Egypt several times, including in 2008 at Ewart Hall, in 2012 at Azhar Park, and 2014 at Kasr El-Nil Theatre. According to Al-Ahram Weekly, she took part in several Arab and international festivals, and won the Palestine Award for Singing in 2000 for her "outstanding style," as well as the Ibn Rushd award for Freedom of Thought in 2013. In 2016, she was named Person of the Year by the Palestinian Ministry of Culture.